Pure Water Gazette » US Dams: Are They Safe? US Dams: Are They Safe? Dam disasters have been rare but spectacular. The recent scare at the Oroville Dam in California has brought dam safety to public attention. The following is adapted from a piece by Jeremy P. Jacobs. 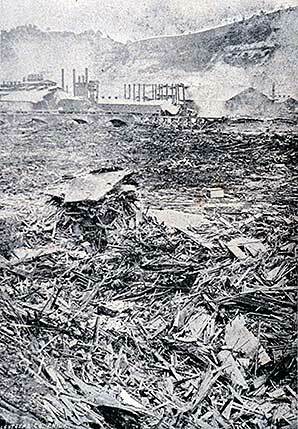 The catastrophic failure of the South Fork Dam in 1889 killed more than 2,200 people in Johnstown, Pennsylvania. There have been many U.S. dam failures. And some have been catastrophic. In May 1889, the 72-foot-tall South Fork Dam on western Pennsylvania’s man-made Lake Conemaugh gave way, unleashing a 40-foot wall of water that hit the city of Johnstown, nearly 9 miles away. More than 2,200 people were killed–that’s 1 out of every 5 Johnstown residents. And in California, the St. Francis Dam was considered an engineering feat in Los Angeles County until it failed in 1928, killing as many as 400 people. The Baldwin Hills Dam, also in Los Angeles, gave way, killing five in 1963. In 1976, the Bureau of Reclamation’s Teton Dam in eastern Idaho collapsed, killing 11 and causing more than $1 billion in property damage. The most recent dam failure to cause a fatality occurred in 2006, when the earthen Ka Loko Dam in Kauai, Hawaii, breached, killing seven people. Some experts caution against making too much of the number of fatalities linked to dam failures. Martin McCann of Stanford University’s National Performance of Dams Program said that since the 1850s, dams have killed probably a little more than 4,000 people — a large number, but one that pales in comparison to auto accidents, for example. “If your argument were to be based on body counts, crocodiles and deer running on highways might beat out dams,” McCann said. He noted that dam inspections and state and federal authorities have improved, especially since the 1970s when fatalities from dam failures peaked at more than 450 in the decade. Reference source: E & E News.